The Champagne Mile recently took Air New Zealand premium economy across the Tasman and then back again. Keen to try it out? Read on for an in-depth review and discover how you could fly this product yourself. While I was originally booked to fly economy, Air New Zealand emailed me with an opportunity to bid for a paid upgrade to premium economy. 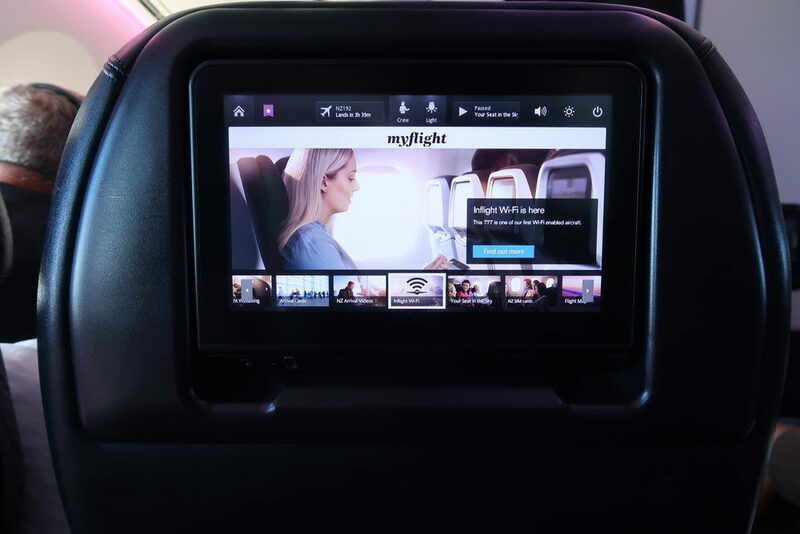 Air New Zealand manages paid upgrade requests through a system called OneUp which uses a commercial back-end platform called Plusgrade. The Plusgrade platform is used by a large number of airlines and allows you to bid for an upgrade on most Air New Zealand international flights. Basically, it works like this: after booking an Air New Zealand flight you receive an email asking if you’d like to bid for an upgrade with cash. You then log into the Air New Zealand website and submit a price you’re willing to pay, using either Airpoints Dollars or cash. I jumped at the opportunity, and with a low bid submitted for both flights (just 10% over the minimum), I was successful both ways, setting me up for an enjoyable journey. 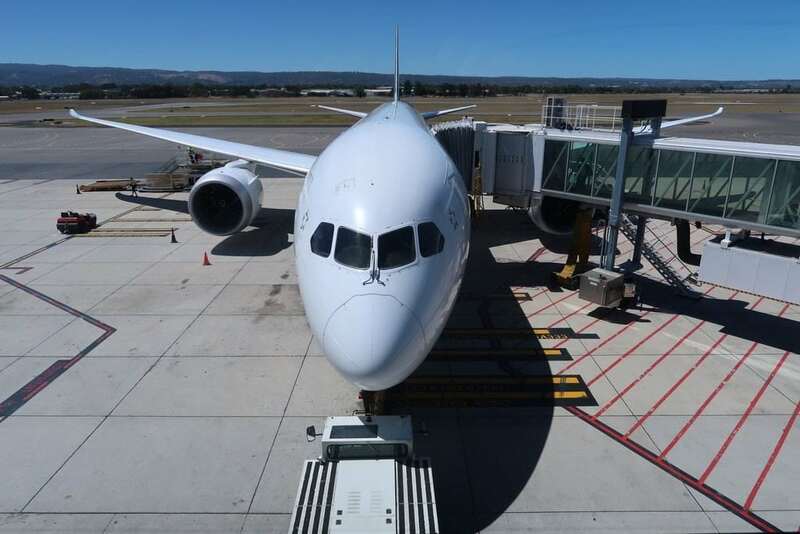 Air New Zealand is currently the only full service carrier flying Adelaide to Auckland, so the pricing isn’t as sharp as Sydney, Melbourne or Brisbane Eastern seaboard routes into New Zealand. However, for me, the saving grace is the convenience – being only 15 minutes from the airport and 15 minutes to check-in, bag-drop and security, you’ll start to appreciate the fact that I left home only 120 minutes before the flight. Once I was through security, I was able to get up close and personal with my ride. Having no real status with Air New Zealand left me no options for a comfortable lounge. However, those with Gold and above status get access to the Adelaide Airport domestic Qantas Club. 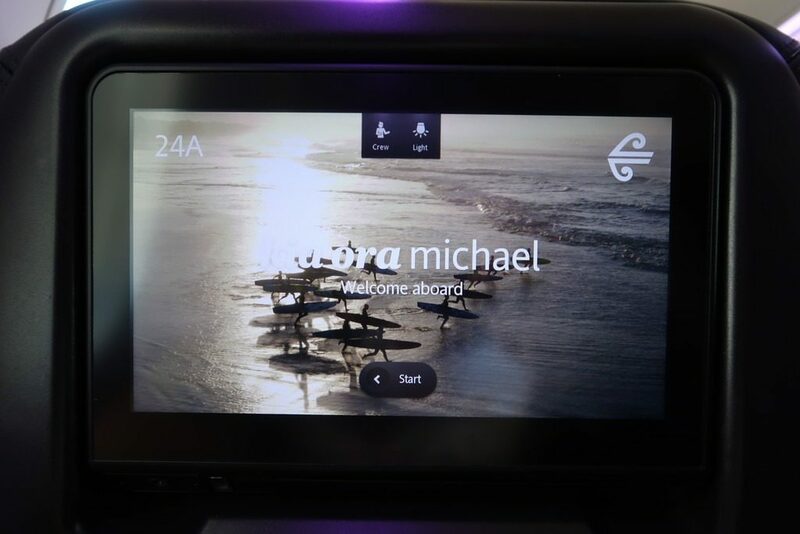 From the moment I stepped on-board the Air New Zealand aircraft, I started to appreciate the subtle differences of the Air New Zealand offering. I find that Air NZ crew are authentic, have the opportunity to let their personality shine through and you get the feeling that they actually enjoy their jobs and want to be there. When you take your seat in Premium Economy it doesn’t take long for you to spot and feel the difference from economy. The key benefits are extra legroom, comfortable leather seats, more stowage space and a menu. 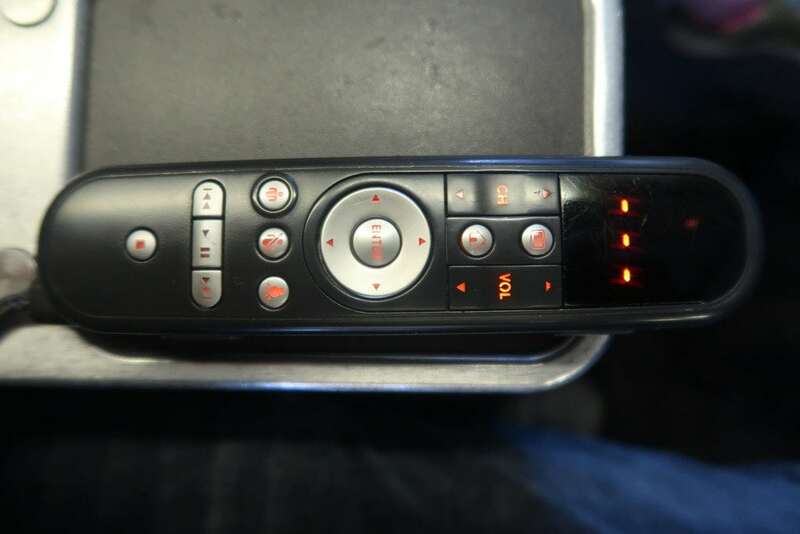 At this point, the Air New Zealand Premium Economy was already above Qantas domestic Business Class in my mind. The Air NZ premium economy cabin is configured in a 2-3-2 arrangement. Each seat is upholstered in dark leather and provides a comfortable 41 inch pitch, with 19.3 inch width. The seat features a recline of 22 cms (50% more than economy), but as I found, it’s unlikely that you’ll need to use it on a 4 hour flight with meal service and movies on offer. Leg rests are also included. With a midday take-off, flying on NZ192 is an attractive way for Adelaideans to travel seamlessly across the Tasman in just four hours, rather than inter-connecting through Melbourne or Sydney and losing a full day. The only downside to my experience on this flight was the safety video – four and a half minutes long, and (in my opinion) not particularly funny. It was inevitable after so many great videos that there’d be a dud and here it is. See for yourself on Youtube. Once the seat-belt sign was off, the Air NZ crew swung into action and this is where Josh, the cabin manager and his other team members kicked off an afternoon of friendly service with an efficiency that some airlines simply can’t pull off. 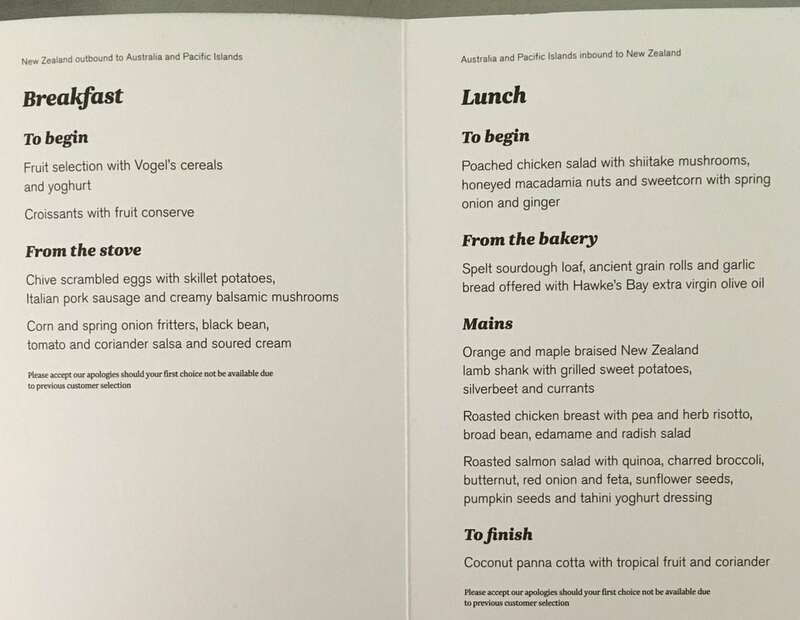 Air New Zealand provides premium economy passengers with a a high-end menu to dine on in-flight. On offer are a number of the dishes that business class passengers on the same flight can enjoy. 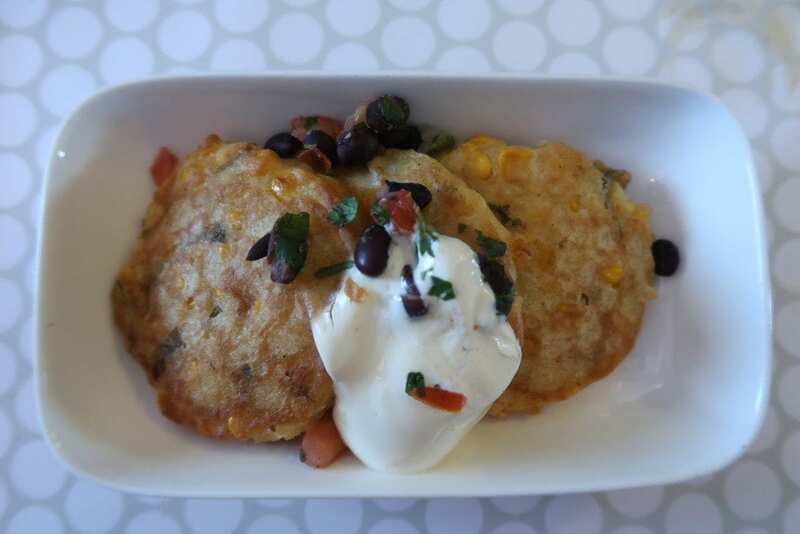 Lunch provided the opportunity for premium economy passengers to choose from a range of entrees, main courses and then dessert (with some delicious breads on offer as well). 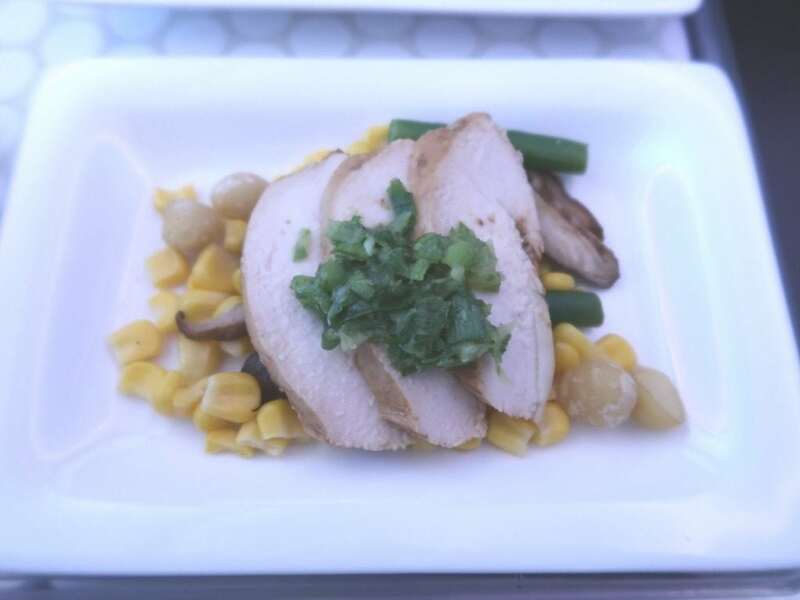 First up, I enjoyed a poached chicken salad with shiitake mushrooms, honeyed macadamia nuts and sweetcorn with spring onion and ginger. The dish was well presented and pleasant but lacked a flavour punch. 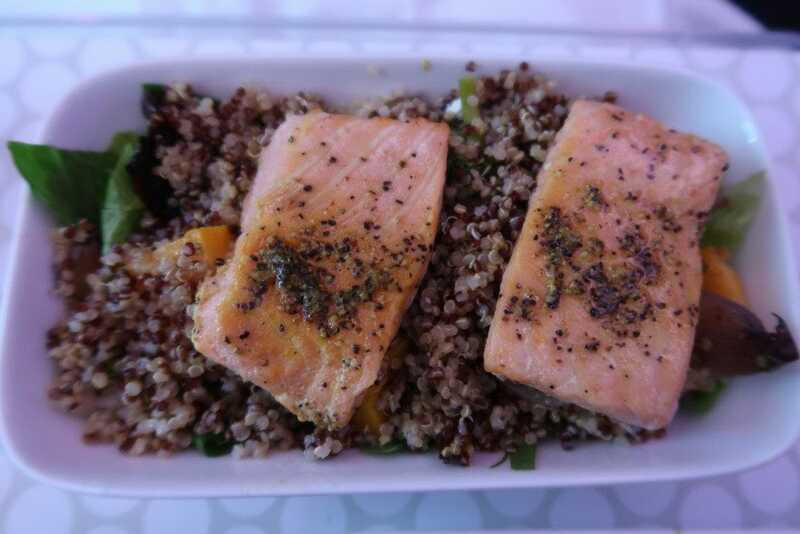 With a choice of lamb, chicken or salmon for main, I opted for the roasted salmon quinoa and chose roast chicken breast with pea and herb risotto for my four year old daughter, who was travelling with me. I thoroughly enjoyed my salmon and then ate the chicken as my daughter was already full from poaching my garlic bread. 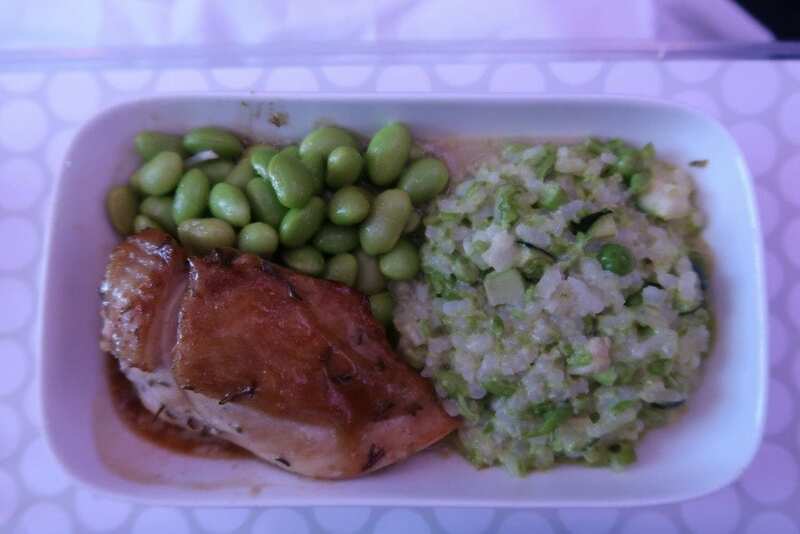 The chicken was safe and non-adventurous and every airline menu has to have one. Finally, it was time for dessert. My daughter was very impressed with the coconut panna cotta with tropical fruit and coriander – an adventurous yet comforting choice. After lunch, the crew provided discrete yet attentive service and proactively offered the premium economy cabin small snacks and drinks. Overall, the service on this Air NZ premium economy flight was excellent, time flew and I was able to arrive fresh and relaxed in Auckland with a happy daughter in tow. As we’ve previously mentioned here, Auckland Airport is the bees knees for a premium Air New Zealand pre-departure service. After a week spent visiting family in Auckland, we were ready to enjoy this experience. 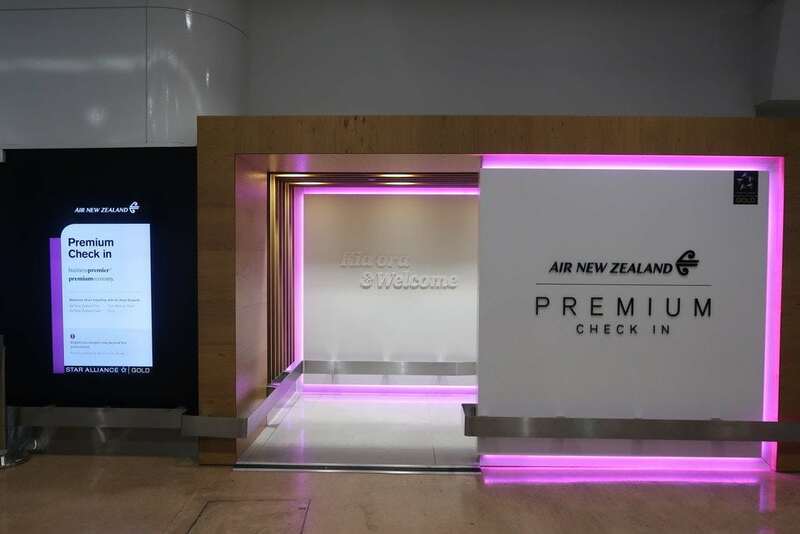 Air New Zealand has opted for a funky and eye-catching entrance to its private premium check-in area, with this service available to both Business Premier and premium economy passengers. With helpful staff to assist, mine and my daughter’s bags were checked in within minutes. Then, it was up in a private elevator straight through to fast-tracked priority screening via Immigration NZ. With a child, a streamlined service like this is a delight! For the second flight, my daughter and I were seated in 23A and B on a 777-200, close to the partition in front. For people travelling with kids or for the long-legged, this is a jackpot seat. I was able to pick-up every pencil dropped, fully stretch my legs out and keep the “entertainment” backpack within easy reach. The premium economy cabin was also near capacity. With this flight departing Auckland at 8.35am, we were well looked after by an Air NZ premium economy crew, Tony and Lucy. The service commenced with hot towels, followed by the breakfast service. My daughter delighted in the croissants served, while I opted for the corn and spring onion fritters over the scrambled eggs. With a touch of salt, the fritters were very satisfying and a good size. The sour cream combined to create a nice contrasting flavour. Halfway through the flight a selection of morning tea snacks was offered, as well as proactive tea and coffee top-ups. 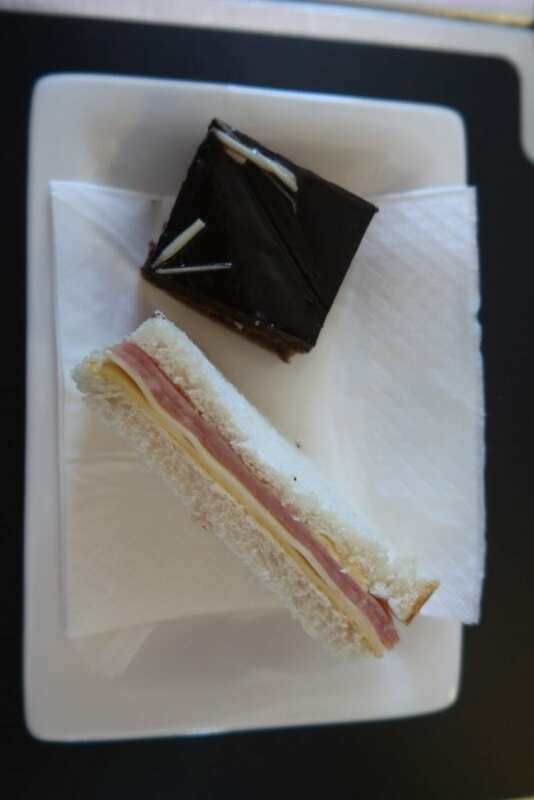 Sandwiches without the crusts were offered to the cabin approximately one hour before landing. These were gobbled up eagerly by my daughter, who now calls them Air New Zealand ‘sammies’. All too soon, the captain was announcing our descent, and it was time to say goodbye to our Air New Zealand premium economy experience. 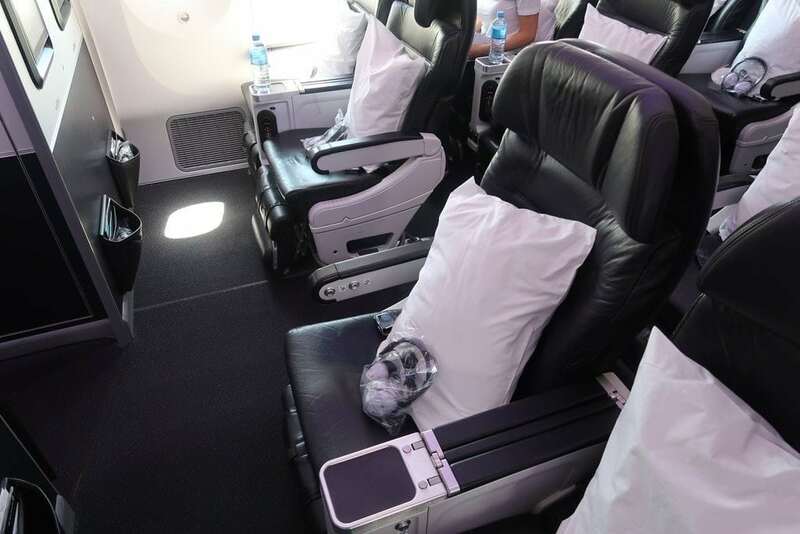 Which seat should you choose in Air New Zealand premium economy? If you value your space, opt for the front row (23) against the Business Class partitions, but if you value openness, opt for rows further back (24). Travelling as a pair, my daughter and I appreciated a window seat both ways. However, larger families may prefer to be seated in the centre of the cabin. None of the seats are overly near toilets and even row 23 at the front, closest to the galley is not overly busy. And, let’s face it, overall, seat selection on four hour daytime trans-Tasman crossings is not that important – particularly when excellent service is involved. The overall quality of the inflight entertainment system is high. It is very touch-responsive. However, the number of recent release movies seemed limited. My daughter also noticed a gap in the children’s entertainment – at 4 years old, there were only 2 or 3 series of 30 that appealed. There was no Dora the Explorer, and very limited Australian and New Zealand sourced content. The catalogue mainly consisted of Pixar and animated movies. Noticeably, the old-school seat control still exists, but there was never a need to use it with the touch-screen system. Unfortunately neither flight had been WiFi enabled. A shame! USB connectivity is provided at the base of the entertainment screens. Overall, I found the Air NZ premium economy experience to be very pleasant. The Air New Zealand crew provided service of an incredibly high standard and the only niggle I could identify was the safety video and you can’t fault the crew for that! The food was enjoyable, though erred on the side of cautious. I would love to see some more adventurous produce and character come through in the food. 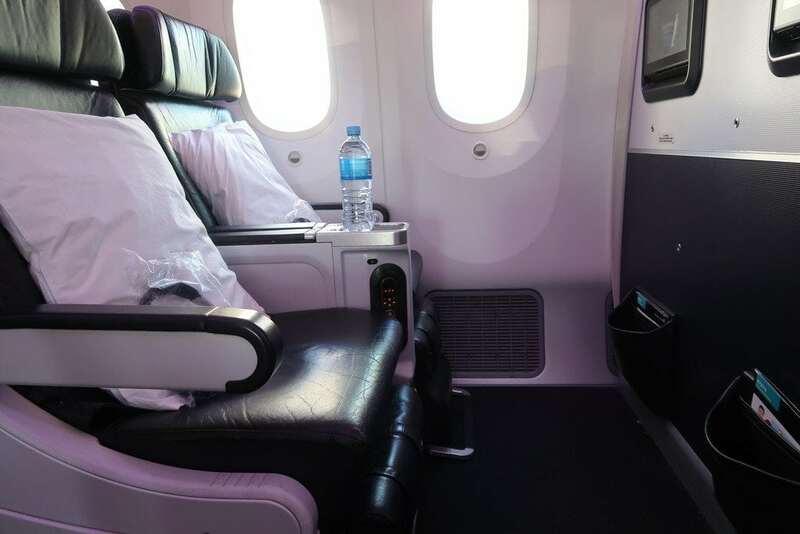 And for families, Air New Zealand premium economy can be a cost effective and less stressful option than flying children in Business Class – particularly if you can score a cheap, paid upgrade via OneUp. The product bridges an important gap between economy and business class, and it’s a great option for shorter international routes during the day – after all, do you really need a lie-flat bed for a four hour flight? There are certainly glitzier ways to cross the Tasman, including on the same plane further forward, or even in Emirates first class. But, at the end of the day, for an enjoyable and fuss-free experience, I prefer flying Air New Zealand over some of its larger competitors. 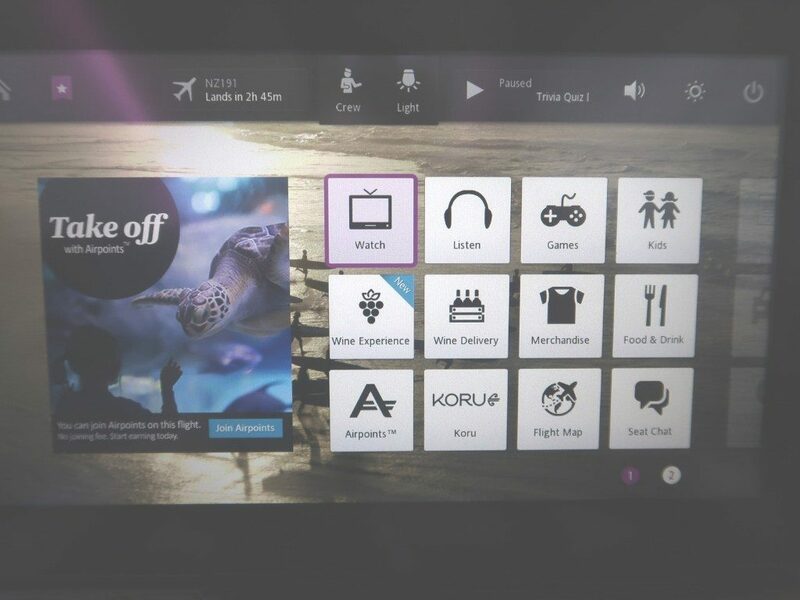 What do you think of the Air New Zealand premium economy experience? Let us know in the comments!